It is 200 years since the birth of David Livingstone, perhaps the most famous of the missionaries to visit Africa in the 19th Century. But as author and Church historian Stephen Tomkins explains, the story of an African chief he converted is every bit as incredible as Livingstone's. 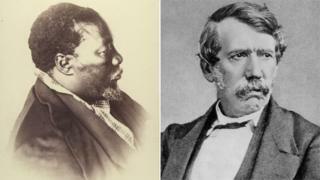 According to the title of one biography, David Livingstone was "Africa's Greatest Missionary". This is an interesting claim about the Lanarkshire-born man, considering that estimates of the number of people he converted in the course of his 30-year career vary between one and none. The variation is because Livingstone himself wrote off his one convert as a backslider within months of his baptism. The irony is that this one backslider has a much better claim than Livingstone to be Africa's greatest missionary. This man on whom Livingstone gave up became a preacher, a leader and a pioneer of adapting Christianity to African life - to the great annoyance of European missionaries. His name was Sechele, and he was the kgosi or chief of the Bakwena tribe, part of the Tswana people, in what is now Botswana. Born in 1812, he was 10 when his father, the previous kgosi, was killed. Two of his uncles divided the tribe between them. Sechele escaped with a few followers into the desert for nine years, and returned to oust one of his uncles. This was how things stood when Sechele first met Livingstone - he ruled a half-tribe. Livingstone persuaded him to make peace with his other uncle by sending him a gift of gunpowder for his rifle. He developed a malaria treatment later sold commercially as "Livingstone's Rousers"
The uncle was suspicious that the gunpowder was bewitched, tried to neutralise it with fire, and in the resulting explosion was killed. Sechele thus ruled over a reunited Bakwena. Like many kgosi, Sechele was keen to have a missionary living in his town. Missionaries came with guns (and powder), making them an invaluable defence, and with medicine. Sechele amused Livingstone by asking for medicine to make him a better hunter. But the thing Sechele wanted above all from Livingstone was literacy. He learned the alphabet, upper and lower case, in two days, compiled his own spelling books, and set about reading the one book in the Tswana language, the Bible. He ate breakfast before sunrise in order to start school as quickly as possible, and then taught his wives to read. As Sechele grew increasingly interested in Christianity, he found two huge barriers in his way. One was rain. Tswana tribes had rainmakers, whose job was to use magic to make the rain come. Livingstone, like all missionaries, vehemently opposed rainmaking, on both religious and scientific grounds. Sechele happened to be his tribe's rainmaker as well as kgosi, and Livingstone's stay coincided with the worst drought ever known, so Sechele's decision to stop making rain was predictably unpopular. The greater problem was polygamy. Sechele had five wives, and Livingstone insisted that to become a Christian he needed get rid of the "superfluous" ones. This was a political as well a personal nightmare, threatening the political structure of the tribe and relations with other tribes. But in 1848 Sechele divorced four of the women and was baptised. The following year, however, one of his exes became pregnant, and it turned out that Sechele had fallen. He repented, and told Livingstone: "Do not give me up because of this. I shall never give up Jesus. You and I will stand before him together." Livingstone did give up on him, going north to embark upon his celebrated adventures. Their last contact was in 1852. Sechele had fought off an attack from the Transvaal Boers, and was en route to Britain to ask Queen Victoria's protection. He got as far as the Cape before being turned back. At this point, Sechele largely disappears from view. His reappearance was startling. The first British missionaries who arrived to work with the Zulu Ndebele tribe in what is now Zimbabwe in 1859 were staggered to find that they already had regular Christian prayers. Sechele had beaten them to it. Sechele had decided to lead church services for his own people after Livingstone left. He taught reading, the Bible became popular, and slowly the Bakwena became Christian. Sechele travelled hundreds of miles as a missionary to other tribes, and having withstood the Boers, the Bakwena became a refuge, absorbing many tribes into their Christian society. At his death in 1892, Sechele ruled 30,000 people, a hundred times the number Livingstone first found him with. Image caption African Christianity: Does it owe more to Sechele than Livingstone? In the estimation of Neil Parsons, of the University of Botswana, Sechele "did more to propagate Christianity in nineteenth-century southern Africa than virtually any single European missionary". For European missionaries though, Sechele was a frustrating puzzle, "a half Christian and a half heathen". He returned to rainmaking, considering it a political necessity, and late in life returned to polygamy, marrying a young woman for what do not seem to have been entirely political reasons. Missionaries also strongly objected to his use of traditional charms and purification rites, and the list of his ancestors on the church wall. And yet, even the ones who most hated him admitted, "he reads the Bible threadbare", and when confronted he ran scriptural rings around them. "Roger had to keep his wits about him," wrote the missionary Elizabeth Price about her husband, "or he would have been lost, so wily and cunning is Sechele - murdering sacred scripture and bringing it to defend him in a way which horrifies and amazes one. A strange, strange mixture he is." The strange mixture was in fact African Christianity. Unlike other converts who were content to follow European Christianity, Sechele went back to the source and recreated it as an indigenous religion. Hopefully, in the year of Livingstone's bicentennial, Sechele will finally get a bit more of the recognition due to him.